Last week was my birthday, and my beautiful fiancée brought me to the city I love most: Chicago, IL. Yes, I already wrote about Chicago, but there is so much more to do and see, that I can write scores more posts about it, and still feel like I have barely scratched the surface of what to share. Yes, the same can be said about every else I have travelled and will travel, and I may or may not write multiple posts on a single location, sharing different things each time in the future. I will say that I went back to Three Dots and Dash. The first Chicago post was the first time I went there, and I loved it. I had to go back. I still love it. I want to go back again the next time I am in Chicago. Turns out, so did my fiancée, and that is where she went for her bachelorette party the week before. This is not a place we can recommend enough. I also returned to Elephant and Castle because poutine. Right: Poutine at Elephant and Castle. This variation included grilled chicken and curry sauce. We tried a pub that we found on random called Stocks and Blondes. It was pleasantly delicious, and a great way to break up the surprisingly chilly afternoon. Found on Wells St on the Loop, the door is very easy to miss. Had I not had my phone on, looking for food, I would have walked right passed it without giving it a second look. Inside, it has the homey sports bar feel to it. If I ever go to Chicago during a Cubs game and do not feel like dealing with Wrigleyville crowds and cannot get my hands on a ticket, this would be the place where I would go to watch it. Pull up a bar stool, get a cold pint, and order a burger, and then enjoy the afternoon. 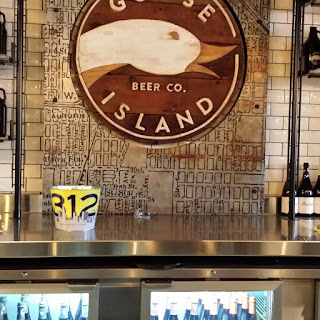 Speaking of cold pints, I finally got to go to the official Goose Island taproom. 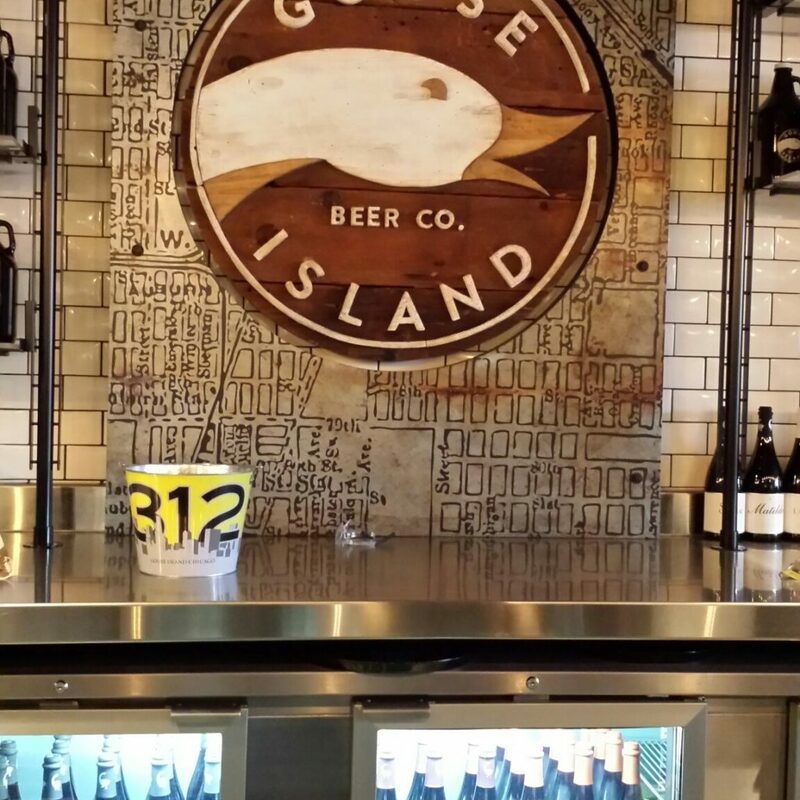 Goose Island is a Chicago local brewery named after, but not found on, the Goose Island in the Chicago River. It was founded in 1988 to bring European beer styles to America, and is my go to beer when at home. It was great to see where my favourite beer was made. While closed on Mondays, they are open on weekdays from 2-8PM, and 12-6PM on the weekends where you can sit and enjoy beer on draft (some brewed only for the bar there and not found anywhere else), their own bottled beer, or a $12/hour tour of the brewery. It is a quick walk from the Green/Pink Lines Ashland station in the Near West Side, and found in an industrial section of the city. Definitely worth the departure from the Downtown area. I stayed in an apartment in Ravenswood (northern neighbourhood). Within a short walk is Lincoln Square. This place is a microcosm of a world within itself. I truly believe that it would be possible to spend your entire life in Lincoln Square, and never need to leave, there is that much to do there. Bars, restaurants, even theatres and art galleries. Lincoln Square in itself is a small slice of Chicago that will take months to explore deeply. Starting Memorial Day, I will be in Cabo San Lucas in Baja California Sur, Mexico for a week. For this, I will try something new: I will post shorter and more frequent posts on an almost daily basis which may or may not be followed by a longer article summarizing the entire trip, depending on how I feel when I come back. Please support this trip, and all future endeavours, by becoming a patron on Patreon (link above).